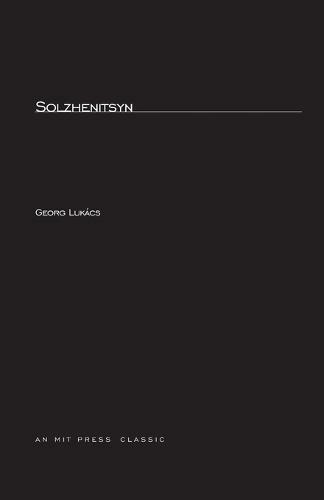 Georg Lukacs's most recent work of literary criticism, on the Nobel Prize winner Alexander Solzhenitsyn, hails the Russian author as a major force in redirecting socialist realism toward the level it once occupied in the 1920s when Soviet writers portrayed the turbulent transition to socialist society.In the first essay Lukacs compares the novella One Day in the Life of Ivan Denisovich to short pieces by "bourgeois" writers Conrad and Hemingway and explains the nature of Solzhenitsyn's criticism of the Stalinist period implied in the situation, characters, and their interaction. He also briefly describes Matriona's House, An Incident at the Kretchetovka Station, and For the Good of the Cause-stories that depict various aspects of life in Stalinist Russia. In the second, longer section, Lukacs greets Solzhenitsyn's novels The First Circle and Cancer Ward, which were published outside Russia, as representing "a new high point in contemporary world literature." These books mark Solzhenitsyn as heir to the best tendencies in postrevolutionary socialist realism and to the literary tradition of Tolstoy and Dostoevsky. Moreover, from the point of view of the development of the novel, Lukacs finds the Russian author to be a successful exponent of innovative methods originating in Thomas Mann's The Magic Mountain.The central problem of contemporary socialist realism is a predominant theme in the book: how to come to critical terms with the legacy of Stalin. The enthusiasm with which Lukacs acclaims Solzhenitsyn will not surprise those who have followed his persistent refusal to endorse the so-called socialist realist writers of the Stalinist era. He outlines the aspects of Solzhenitsyn's creative method that allows him to cross the ideological boundaries of the Stalinist tradition, yet he finds a basic pessimism in Solzhenitsyn's work that makes him a "plebeian" rather than a socialist writer. Of Ivan Denisovich and the future of socialist realist literature, Lukacs urges: "If socialist writers were to reflect upon their task, if they were again to feel an artistic responsibility towards the great problems of the present, powerful forces could be unleashed leading in the direction of relevant socialist literature. In this process of transformation and renewal, which signifies an abrupt departure from the socialist realism of the Stalin era, the role of landmark on the road to the future falls to Solzhenitsyn's story."